This post is the second part of the two-post series on information categorization. Click here to read the previous post in a new tab on your browser. In the previous post, I said that organized content was like a sanctum, and that the followers of the almighty needed more than one door to seek Him. I also said that I would follow that post with my interpretation of the verses from the Bhagwad Gita. This post contains my interpretations of the 15th chapter, which hints about the inverted tree structure of information. Interpretations for techcomm: The ancient Indian scriptures contain symbolism and cues for human behavior. The tree is a symbolism for the upside down structure of information. The roots, which are above, are the business benefits and the branches and sprouts, which are below, are the topics and tasks, respectively. Though the description of the tree sounds unusual, we come across such representations even in our daily lives – A family tree, for example. The word Avyayam means imperishable – the root word is Vyaya, which means “expense” or “spent.” The word Ashwattham means perishable – the root word is “a-Swaha”, which means “that, which is not permanent” or “temporary.” According to the Bhagwad Gita, when we know and achieve our purpose, we (or our thoughts) don’t remain perishable, but become imperishable (Ashwattham-prahuravyayam). The roots of the tree represent the need (or benefits) of a product or service. The branches are topics, each sub-branch is a group of similar tasks, the sprouts (or twigs) are the tasks, and the leaves are the functions of tasks. And, unless we connect our readers’ searches with their business benefits (And, help establish the flow of logic from functions to tasks to topics to roots. ), the information structure remains perishable. Translation: The branches of the tree spread in all directions. Some branches become roots to another tree. Gunas (or traits) govern the branches (More on Gunas toward the end of the post). Interpretation for techcomm: The topics join to form the tree trunk. And, the groups of tasks contain new branches or twigs. Just as the young branches grow up thicker to contain smaller branches, sprouts, and leaves, some topics can branch out into more granular levels of tasks and functions. Some branches (or topics) can in this way become roots for several underlying tasks. And, eventually the information tree can become a tree of trees of information. An omnipresent tree of trees may thus be good for a large-sized product or service, which contains a lot of underlying components, concepts, features, and procedures. But, enormously large information structures contain abundant information. Consequently, the readers lose their “connect” with their business needs, and get mislead. As we saw in my previous post, an overload of information is never a good practice. The flow of the information between functions and tasks, tasks and topics, and topics and their underlying business benefits is unidirectional. That’s because, each business benefit can connect to a lot of topics, tasks, and functions. We may confuse our readers if our information flows from the business benefit to the functions. Such a confusion will divert our readers from their objectives. Even worse: One diversion may possibly lead to another. Translation: The tree neither has a beginning nor any end. But, by being positively detached, one should aim to see beyond the Ashwattha tree. Interpretation for techcomm: Though each business benefit eventually drills down to granular information, we should never define the severity (or importance) of any business benefit based on only one function, task, or topic. Even though a function distantly relates to its business benefit, the function alone is neither the beginning nor the end of the readers’ requirements. The readers do not always see the connection between similar (or interrelated) tasks, topics, and business benefits, unless we show it to them. It is therefore sensible to create need-based, intuitive flows of information from granular content to summarized business benefits. We should also realize that fragmented information appears confusing and useless, unless it is interrelated based on the need. 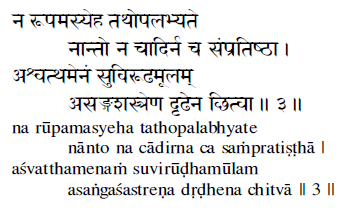 Translation: One must spiritually rise to attain the goal beyond which nothing lies; seek refuge in the one and only Purusha – or, the Supreme Soul – who is the originator of the branches, sprouts, and leaves. Interpretation for techcomm: A help is never helpful if readers do not refer to it. And, unless readers give up experimenting, they never refer. But, while this may be the literal translation, the bigger meaning lies between the lines: Lord Krishna tells us to surrender our ego. We, as writers, must take every step possible to bridge the gap between our developers’ work and readers’ needs. Information findability is a cyclical process; a never-ending task. A symbolic representation lies in the helping hand that Lord Krishna lends as he guides us through to the very end (or Prapti, which literally means achievement). We too must help our readers find their way through the infinite loops of information. As technical communicators, we must ensure a continuous, uninterrupted progression of our readers towards their Prapti. Translation: Free yourself from the false ego, delusion, or pride; positively detach; and liberate from the contradicting dualism, in order to attain the imperishable goal. Interpretation for techcomm: This verse is solely about the reader (The Seeker, in our case.) and their qualities. Although this is an ideal scenario, which is solely a subject of spiritual interpretations, I believe we can draw something that applies to our faculty of knowledge. Also, it is from this verse that the topic drifts into a lot more deeper, spiritual, and transcendental journey. 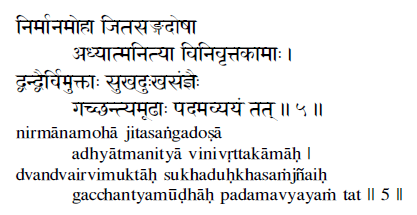 And, hence I am not including my interpretations of the remaining 15 shlokas or verses of the chapter. Absence (or, at least, reduction) of “I” or “mine”: Lord Krishna says that the seeker of the knowledge, or information in our case, must give up the false sense of ego. Although, I do not recommend to project any such sense from my documentation, I feel that we can frequently seek the readers’ attention using context-specific tool-tips and help pop-ups: In some way, help the readers before they ask for any help. Once the “I”, “Me”, and “Myself” notions diminish, the readers can focus on positively detaching from the functions (or the leaves in this case). Positively detached readers do not divert their focus from the goal (need or benefit, in this case) – Unless an overload of information shifts their focus and delivers the information as a by-product. Another quality is of successfully dealing with contradicting dualism: fear and confidence, praise and criticism, or likes and dislikes. From what I can understand, this attribute is as much for our readers as it is for us. An ideal writer neutrally receives comments and criticisms. Neutrally, because they are neither happy to receive a positive feedback nor sad to receive a negative one. This neutrality helps create a positive detachment, and keep the focus on delivering correct information correctly. A sprout or twig can never become a branch or a root. For example, Changing a Password is a sprout, however, Managing User Accounts as a branch can root another such information tree. A tree that has several roots and branches, and maybe countless sprouts and leaves, represents the sanctum that has more than one door, and the follower can come in from anywhere to seek the almighty. It resembles a big product with a lot of business benefits, and search topics and tasks. And, users can search anything, from anywhere, anytime. Technically, I can infer that the farther I go away from the root, the thinner the meaning of the business benefit becomes. But, if and when I write for a tree the branches of which are roots of another tree, I write about the branched benefits, and not about the core benefits (the root of the roots). So, the distance between a sprout and its root does not impact the establishment of the context. We mentioned about the Gunas or traits. A Guna literally means quality. A reader is ready to learn only when they are free from false ego. Similarly, as writers, we too must be free from the false impressions. We should attempt to see beyond the obvious and help connect the business benefits with tasks and topics. 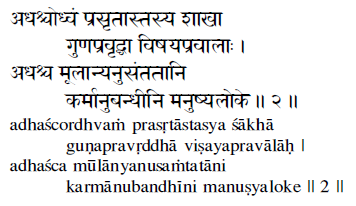 In the verse 2, Lord Krishna says that Gunas govern the branches. That’s because business users do not search based on the search paths laid by the writers. They search based on their business needs. Today, almost all information is interconnected. In my current stint, an information tree connects or cross-refers to a lot of other information trees around: A function connects to more than one business benefit, a task relates to more than one topic, a document cross-refers to another document from another release. At times, our readers cannot either see these interconnected Ashwatthas or see beyond one Ashwattha. As writers, we need to help them see and understand these interconnections. In the end, this interpretation is limited to my spectrum of knowledge, imagination, and belief. <Promise!> I’ll attempt to neutrally receive your feedback. Suyog , Gita has always left a unique impression on every reader’s mind no matter what his perception may be ! Its co-relation to flow of information has stimulated me to think on it with a different angle. Thank you, Juhi. Your comments have inspired me to write more on this topic. Although I feel that with the little knowledge I have on either, I will need some research before I begin to compose any message. Just what I told to Sriram, I am composing another post on information tree, where I talk about my wish to create a content-driven value system. My research will help me map my understanding and train of thoughts. Thank you for writing. Keep inspiring. 1. 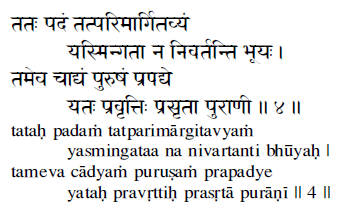 Verse 1: The interpretation of the Inverted tree to TechComm implying that the roots which are above are the business benefits does not hold good. As we all know the essence of Bhagwad Gita is that we reap what we sow. If one performs good deeds, they will be rewarded accordingly, and on the other hand if one performs evil deeds, they will be punished accordingly. Further Lord Krishna also advises a disillusioned Arjuna to do his duty selflessly without thinking about the consequences, and leave the rest to him (Lord Krishna), and the Lord will take care of the consequences. Here Lord Krishna advises a dis-illusioned Arjuna to fight his enemies in the battlefield of Kurukshetra which is Arjuna’s task and leave the consequences to Lord Krishna. Comparing this with our TechComm, we technical writers also perform our documentation tasks. Thus these tasks can be compared to the seeds which we are sowing. These seeds form the roots of the plants, which in turn grow into a massive tree with huge branches and finally yield fruits. Thus citing this example, it will be apt to say that these fruits can be broadly referred to as the business benefits which we achieve due to the result of our routine tasks. 2. Verse 2: The branches of the tree spread in all directions. Some branches become roots to another tree i.e. The Banyan tree for example. Your description of the Verse 2 is perfect. Similarly, the verses 3, 4, and 5 are aptly written. 3. Coming to the conclusion of your post, in the third point you have described the root of the tree as the core benefit. Again I would like to stress the fact that the roots can be compared to the multiple tasks which we technical writers perform, and the sprouts, branches, fruits are the business benefits which is the Prapthi i.e. the achievement. What you say makes perfect sense to me, Sir. Now that I am looking at creating a post on a content-driven value system, and I will incorporate your comments into that post. Thank you for writing.